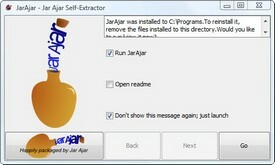 The Jar Ajar tool is a JAR-based self-extractor for ZIP files, where one file serves as an installer, launcher, and program shortcut. Learn more about the new integrated Installer/Launcher/Shortcut system in Jar Ajar 0.5.0. The goal is for Jar Ajar packages to be a single-file, double-clickable solution to installing and launching Java software. Jar Ajar 0.7.0 adds new ways to package files. Check here to see if you have a compatible Java software (v.1.4+, freely downloadable). For more details, see "Which Java version do I need?" Which Java version do I need? Jar Ajar is a Java-based app designed to both package files and self-extract them on any system running Java software, version 1.4+. How do I install it? 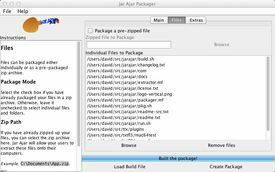 Jar Ajar software comes packaged in its own Jar Ajar installer. No registry entries are altered. The installer will also launch the program when you run the installer again.